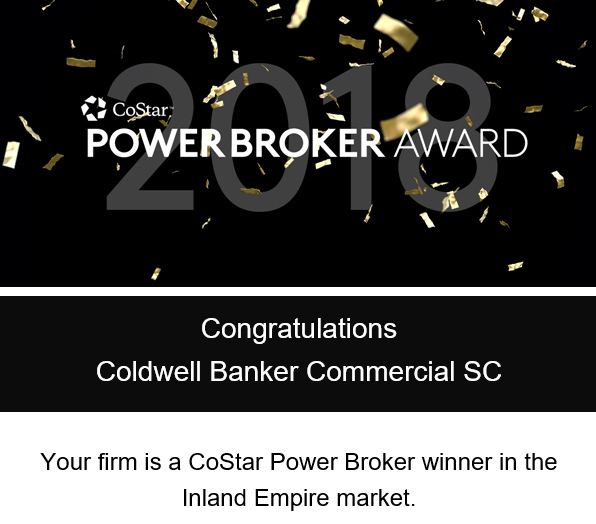 Coldwell Banker Commercial SC (CBC SC) has been selected by CoStar Group, Inc., the leading provider of commercial real estate information, analytics and online marketplaces, to receive the CoStar Power BrokerTM Award for the seventh consecutive year. This annual industry award confirms and recognizes “the best of the best” in commercial real estate brokerage by highlighting the achievements of the firms and individual brokers who closed the highest transaction volumes in commercial property sales or leases in 2018 within their respective markets. As the largest professional research organization serving the commercial real estate industry, CoStar is uniquely positioned to identify the top firms and brokers in each market throughout the U.S. All awards are based on transaction data maintained in CoStar’s commercial real estate database, which is the largest independently researched database of commercial real estate property information available online. CoStar’s Power BrokerTM Award recognizes U.S. firms and individual brokers who have the highest overall transaction volume in commercial property sales and leases in each market during the previous year. For more information, please contact 951-200-7683.